Barnes & Noble brings the holiday wish list into the modern age via a new television commercial that shows off the “Catalog” and “Scrapbooking” features (which enable people to save and organize images in one place to easily share with others) of its Nook HD and HD-plus tablets. The television commercial, which will begin running this week, shows a mother and her daughter perusing electronic catalogs on their Nook HD. When the mother leaves, the girl continues, saving different pages and images in a single file that she calls “Dear Santa.” After she completes her list, she leaves the Nook in the family’s mailbox addressed to the North Pole as a way of sharing her wish list with Santa. 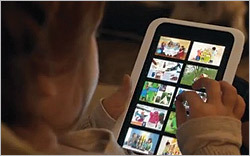 Along with “Share” -- a pre-Black Friday television commercial that showed a family passing a Nook among each other with different user profiles set up for each member -- the new commercial (which will run in concert with “Share”) is meant to position the Nook HD and HD-plus as the “ideal tablet for families,” Kaplan says. Since first creating advertising for the Nook in April 2011 (when it was positioned as the ultimate e-reader), Barnes & Noble has subtly evolved the product to show off more tablet features. That evolution, however, does not mean the Nook has lost sight of its primary purpose or core audience, Kaplan says. Both “Share” and the “Dear Santa” commercial, which were created by advertising agency Mullen and directed by Todd Field of Smuggler, will run throughout the holidays on broadcast and cable networks, on programming such as “The Voice,” “X-Factor,” “Dancing with the Stars,” “Grey’s Anatomy,” “The Mindy Project,” “The Good Wife,” “Survivor,” “Nashville,” and several others. The company estimates the commercials will receive 1.2 billion impressions nationally throughout the campaign. Not surprisingly, the “Dear Santa” spot will also run in digital channels that also appeal to heavy Pinterest users.